Last fall Nate and I decided to start the 2016 season off early with the Ironman 70.3 Pan American Championships in Panama City, Panama. I have never raced in January, but I was excited to get out and test my early season fitness. 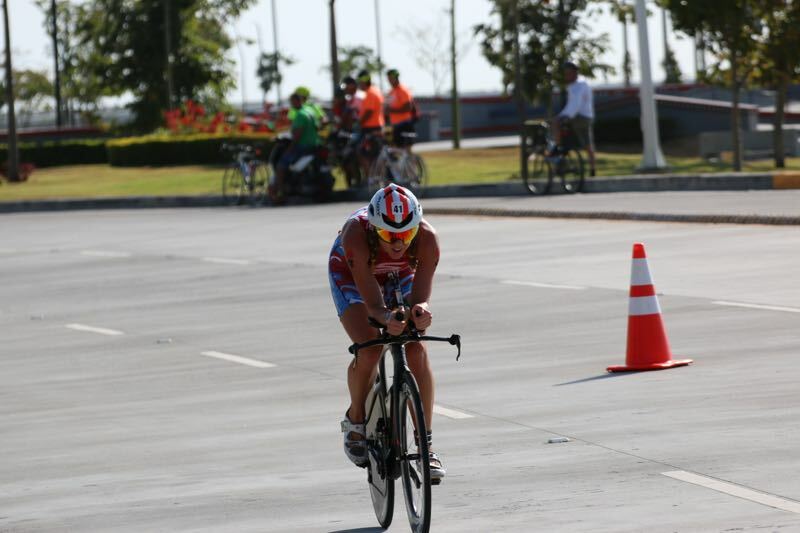 Although this was an international race, it was close to home and had big points and prize money. I had some solid sessions over the past six weeks, but my training was not as consistent as I would have liked. I had a break and an off season in November. While I was in Missouri over the Holiday season, many of the highways flooded and I was unable to swim for a week. 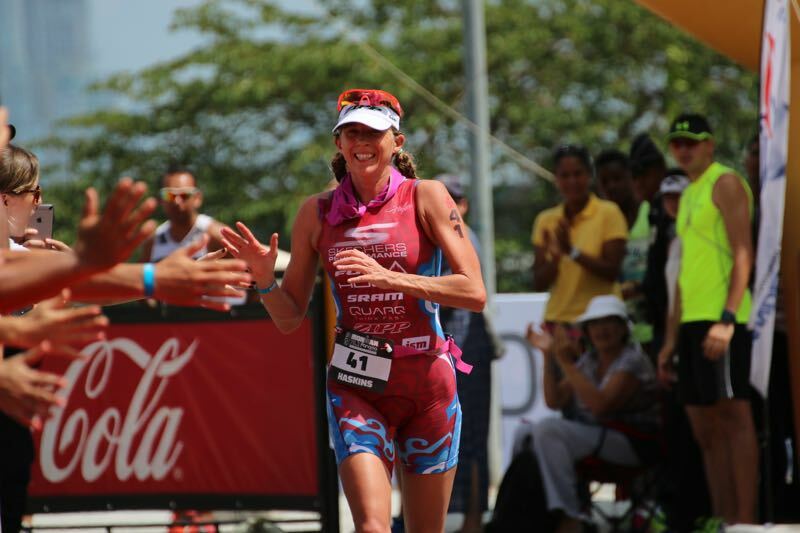 Two weeks before the race, I caught Caroline’s chest cold and was unable to swim for another week. I only felt bad for a couple of days, but the cycling and running came around a little easier than the swimming. The water pressure on the lungs really exacerbated the chest cold. I managed to get in the training I could without overdoing the sessions. I was finding that balance between gaining fitness but yet still recovering from the cold. Before the race, Nate gave me a great tip in remembering what great key sessions I did have and not think about the sessions I missed. 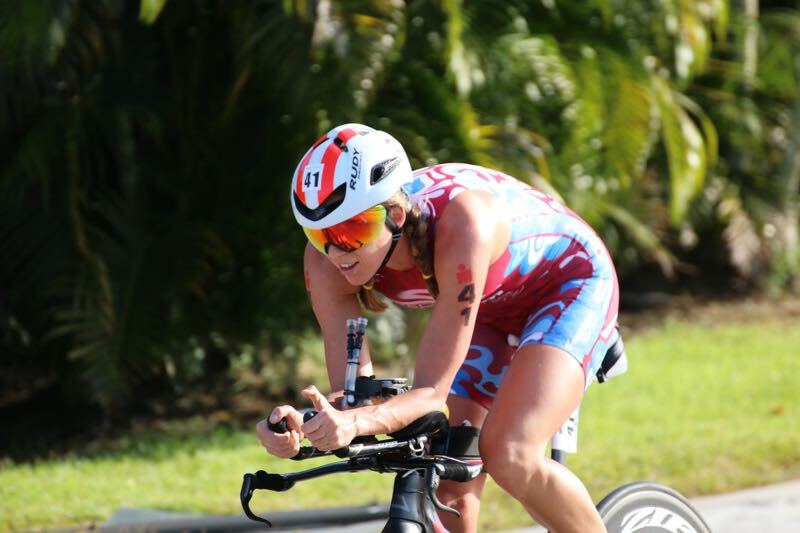 Prior to the race instead of focusing on long sessions, I focused on completing shorter, higher intensity training, especially on the bike. 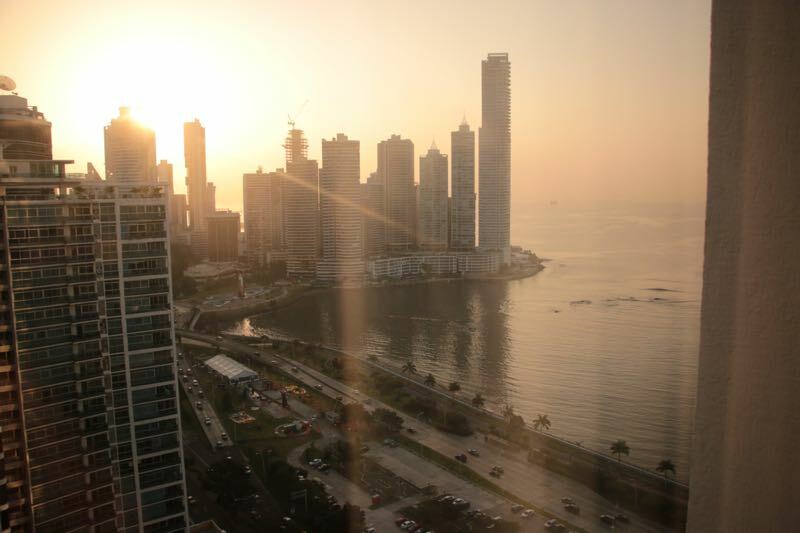 This was race was my first time to Panama. Nate and I loved the hotel and vibe of the city. I felt like the city was a combination of Miami, New York City (with all the tall buildings) and San Juan, Puerto Rico. Race start was predicted to begin at 6:35AM for the professional women, so I had a early wake up at 4AM since I had to take a shuttle to race site and not sure how long it would take race morning. I left on a 4:35 AM shuttle and was at race site by 4:45AM. By 5:30 AM, I had T2 and T1 set up, bottles filled and made the jog down to swim start. 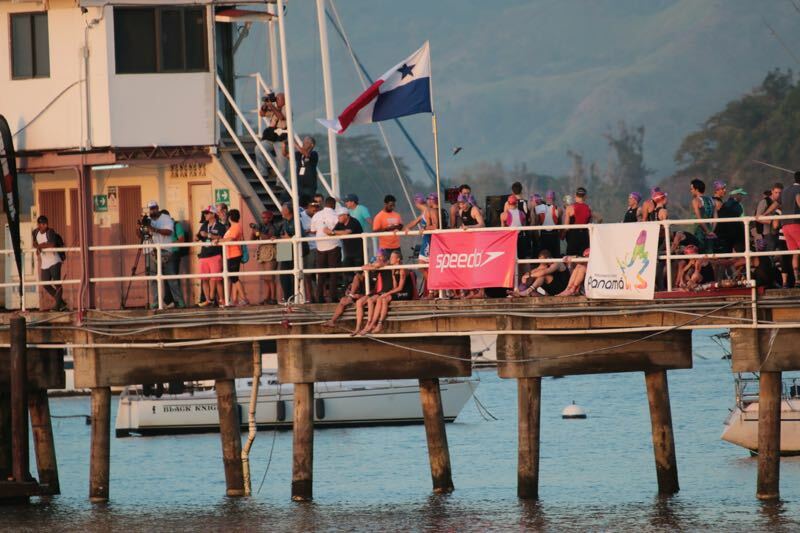 The swim was a point to point in the Panama Canal. 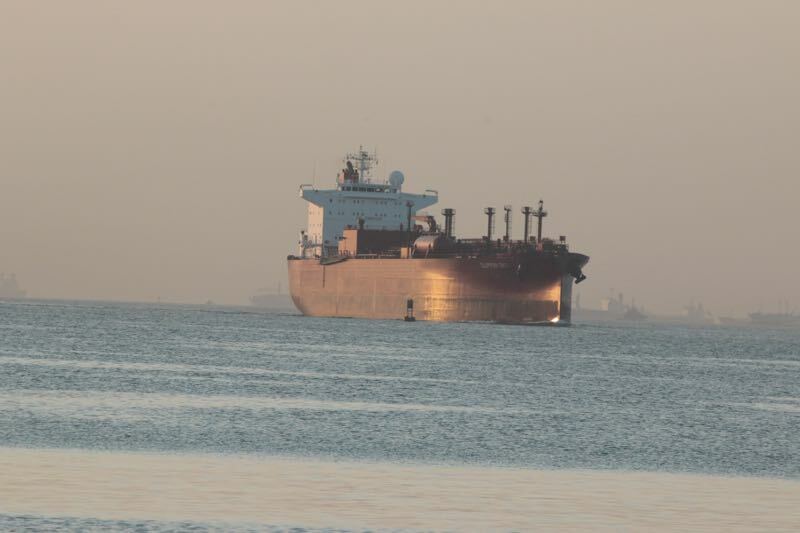 Prior to swim start it was quite a sight to see huge cargo ships passing near where we would be swimming. I was told by race directors that this race has a tendency to start late. I was ready to go on the pier at 6:25, but we ended up waiting another 50 minutes before getting in the water. I made the mistake of leaving my backup gel and water (to take in case of a delay) with Nate and not bringing it with me on the pier. I was very excited to get going once the gun went off. The air temperature was already getting warmer with bright sunshine in the sky! I started off the swim with Lauren Branden. She is an excellent swimmer and it was my goal to stay with her throughout the duration on the swim. I wore the supper fast HUUB swim skin along with the HUUB Aphotic Swim Goggles. With the swim being point to point, in addition to a current, it allowed for groups to stay together easier. Lauren, me, Lauren Goss and Heather Lendwey exited the swim within 10 seconds of each other. Once I was on the bike I felt good and I took the led after a kilometer or so. I wanted to push, but keep the pace controlled. The bike course was changed just a day before the race, to three loops. Within the three loops we had four 180 degree turns, so in some ways, the bike course felt more like an ITU or short course race course. The second lap got a little congested at the start. 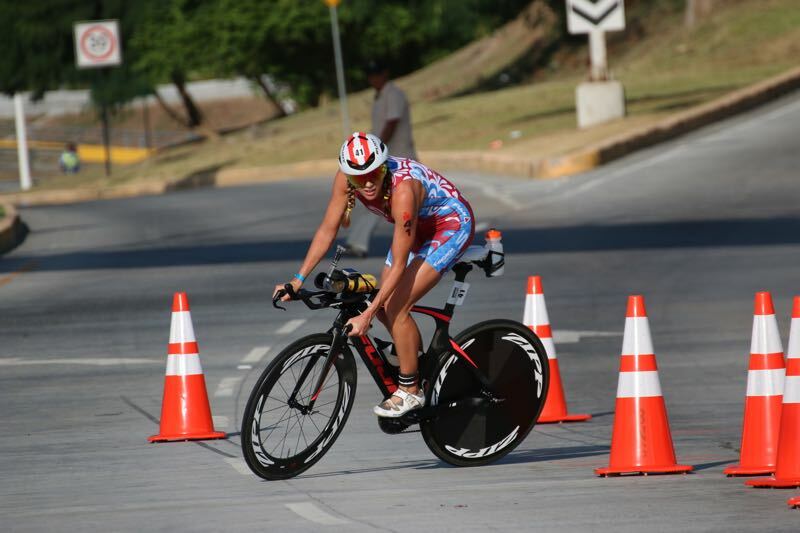 There were a couple of age group men that I passed who then tried to start racing me. Fortunately the motor bike saw this and warned the age group athlete to stay out of our way. One section of the bike had a narrow, no passing zone, but the majority of the bike was on open roads with smooth pavement. In the middle of the second lap at the aid station, I tried putting a surge on the girls behind me. I pushed about 10-20 watts above 40k pace, but I noticed the group was strung out a little but mostly stayed together. With so many turns on the course, it made it very difficult to separate and make moves. The last lap, Heather Lendwey moved up to the front and made a surge. I worked to stay behind Lauren Branden and the three of us separated from the rest of the group. On the last aid station, I slowed to grab and fill a bottle. I was focused on watching Lauren in front of me, but didn’t realize Heather had made a break. We only had about 10k left on the bike at this point, so I decided to keep it under control and not chase and get ready for the run. Here is my Quarq Elsa Powermeter file presented by Training Peaks. My bike was set up with the following for race day: Fuji Norcom Straight 1.1 with: Zipp Firecrest 808 tubular with Tangent SLSpeed Tires, Zipp Super-9 Disc Tubular with Tangent SLSpeed Tires, Quarq Elsa RS Power-Meter, the new SRAM eTap wireless components which are amazing, ISM Time Trial saddle, Zipp Vuka Stealth Aerobars, Speedfil A2 with Z4 Cage, Speefil R3 rear Waterbottle holder, Sampson Stratics Carbon Ti Pedals, and Rudy Project Boost 01 Helmet and Rudy Project Tryalx Orange Fluo Glasses! I felt pretty good throughout the bike, with the exception I had a headache. I was a little worried my electrolytes were off based on the heat early in the day. I tried to take in some extra salt, but on the second lap, I fumbled with the case and lost all my salt. This shook my up a little bit, but tired not worry about it and stay confident that I could handle the upcoming heat with the nutrition I had remaining. Looking back after the race, I think I did not have enough salt pre-race. Just prior to race start, I felt really thirsty and drank a bottle of plain water. I believe I depleted some of my electrolytes, but throughout the race, was able to get my body back in check. I loved my new Zipp Vuka Stealth Aero Cockpit. The set up is very aerodynamic and fast and allows me to get in a better position than before. 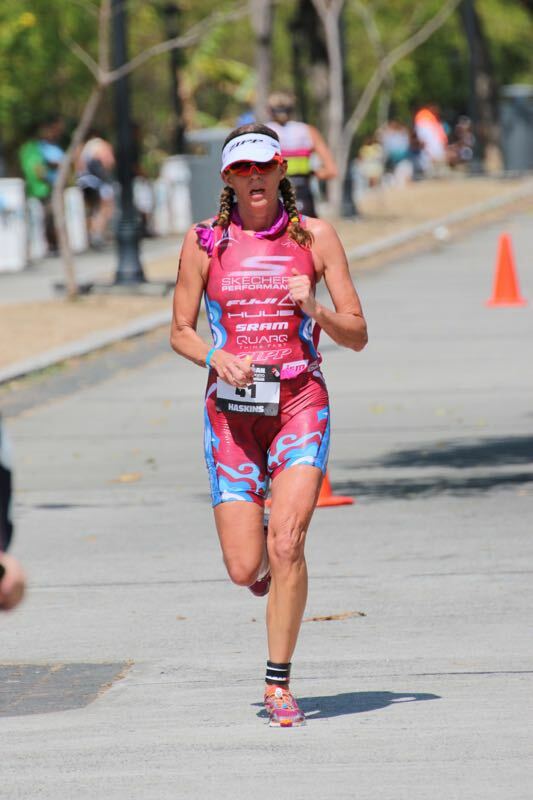 Last year my hip flexors were screaming and giving out and the end of the bike portions of the races, so by adjusting my position it allows me to use my core and glutes and puts less strain on my hip flexors. I exited the bike with Lauren in third position. I felt like molasses moving through transition. I lost about ten seconds to Lauren in T2 and it took me about a mile to start feeling like I could actually get into a rhythm. I ran in the Skechers GoRun 4’s , which are really light and I do not even need socks in them as they are so soft. My new Triflare race suit was really comfortable for the day. I did not get chafed anywhere, which is a first for me. The run was very warm and I never felt like I was moving fast! Heather Lendwey was 90 seconds up the road and I did not focus on catching her at the start, I just wanted to get into a comfortable pace. About 6k into the run, I passed Heather and from that point, I focused on staying hydrated, staying cool by using my Mission Cooling Towel and keeping my legs moving. I treated the aid stations like buffets; getting water, ice, (more) water, and Powered. The second lap, I started grabbing Cola. I don’t drink soda and don’t even like soda, but during the race it was great! I saw the sign for 20k and so excited for just about 1k to go. That last kilo seemed to take forever. My legs were had that heavy, slow feeling. I was very excited to see the finish line. 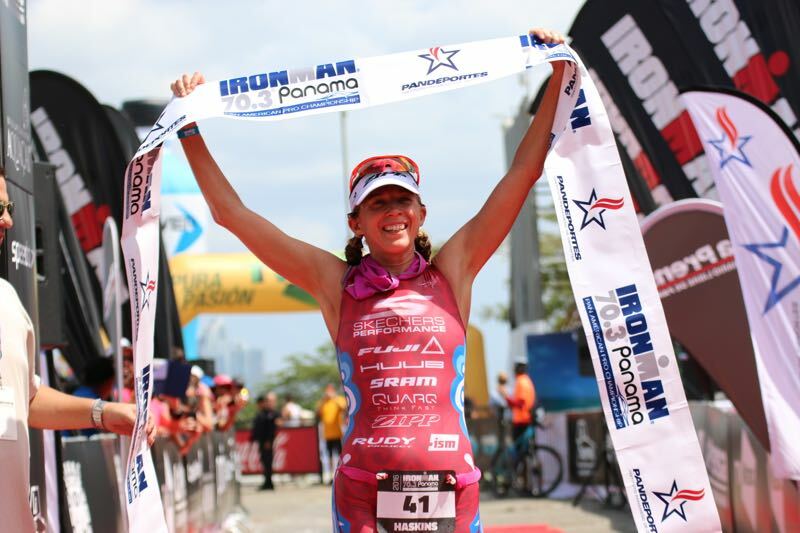 I was so happy to have my fourth 70.3 win and first regional championship win. So many people worked hard to put this race together. The crowd, volunteers and race organizers did a fantastic job keeping everything going pre/during/post race. This race would not have even gone off without their hard work! 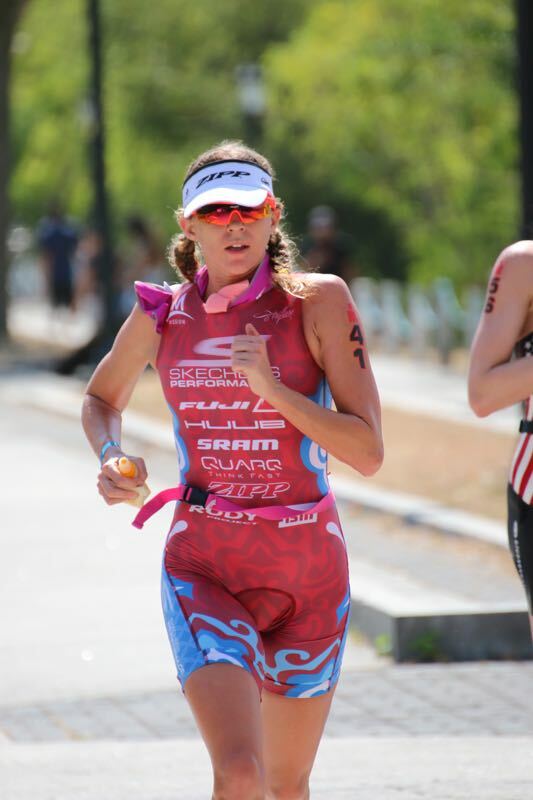 I loved racing in my new Triflare suit! Thanks to all my sponsors and supporters! What a great way to start 2016!